More features to improve User Experience! We have added a new section – ‘Kaleidoscope’ for ‘Industry Leaders’ Success Journey’, where the successful and progressive industry heads share their experience and views on points of our interest for every business. It is interesting and inspiring to read through their journey and their opinions. We also have added one more section that will show Top Ranking Members of ENEFINDER. The Rank of a member signifies their rating about product and service quality and level of being active in the market. This in a way also is a reliability index calculated on many related indicators, which should give more confidence to a person to do business with them. A couple of Layers of Membership for ENEFINDER have been added so that Members can choose to have suitable option suitable to their activities and the related privileges. Similarly, sequence of products displayed in search results on relevant pages is also decided based on completeness and reliability of information. This also can be found more convenient for buyers for sourcing. Membership Grades are: Standard, Premium and Supreme. Every Member has option to upgrade to any of these Grades and enjoy the benefits. For those Members, who wish to publish their technical or management articles, they now can share these articles to their other network, outside of ENEFINDER. This should enable more knowledge-sharing of the related subjects/discussions on other platforms. You can also select and share other pages like News and Events, Products, Services etc. We also are now giving options in hands of Members to select (or to de-select) any alerts / notifications for the topics of their interest. There can be alerts on various sections like products uploaded, services uploaded, tenders/RFQs posted, News & Events, Jobs & Vacancies, Articles etc., and a Member can select for which subject he would like to receive alerts. The Section of Excess/Surplus Inventory of ENEFINDER has a new name with more ease of operations. Anyone can download this App – ‘Extok’ on his android mobile phone to check available stocks and make a deal directly with the Member. There are some more features under development and those will be available as and when they are ready. 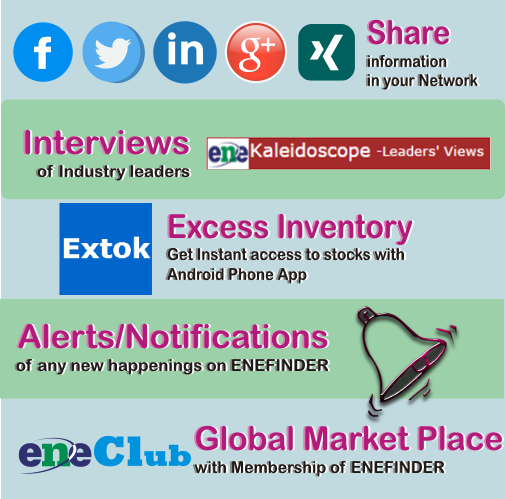 We are sure; these features will add more utility to use ENEFINDER for all our Members. We look forward to your support an continued association with ENEFINDER. ENEFINDER (www.enefinder.com) is India's first B2B business directory for Industrial Electrical and Electronics Products, Components and Services. ENEFINDER is a unique global online business directory for products, services from industrial electrical, electronic and automation fields. It is a world marketplace for promotion & branding of products, components and services in Power and Energy sectors. ENEFINDERgives the details of electrical suppliers , manufacturers of electrical and electronic products, suppliers of electronic parts at one place. ENEFINDER also provides a knowledge and resource base for professionals to utilize for their product research and design work. Some of the resources at reach are technical articles, product videos, important links of related service providers and interactive forum. 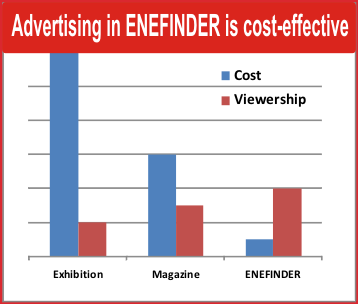 ENEFINDER is also an excellent medium for promoting products through aggressive marketing and advertising options. One can launch his new products globally from enefinder, can upload product videos, technical articles and also job requirements. At the same time ENEFINDER is a very good place for sourcing electrical and electronic products from around the world. ENEFINDER has a special section for dealers, distributors and traders, as these business categories have a very important role in the business. ENEFINDERhas been designed and developed by Vasudha IT Solutions Pvt. Ltd. (www.enefinder.net), Pune, India and launched in January 2010. VITSPL is part of Vasudhagroup companies(www.vasudhagroup.com) focusing in the business of various IT based solutions to industry. The Promoters and Directors are having sufficient experience in this field and have plans to bring in many more similar products in coming future. World’s first and only online directory specifically for focussed product sector. Over 90% of the Members and visitors are from the relevant field. Most economical and effective platform for product promotion and brand promotion, globally. The directory listings are focused on Electronics, Electrical and Automation Companies; which gives a distinction of being a specialized directory or database of companies into electrical, electronics and automation industries. Ability to find associated business services providers from the same industry. Can get information on happenings in the related field around the world. With a nominal yearly charge, you can enjoy more privileges of eneClub. Membership details are available for existing members for upgrade to either Premium or Supreme category.